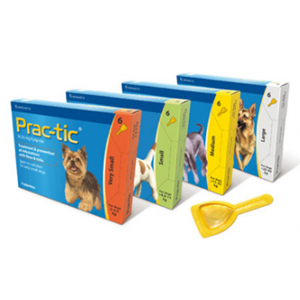 Prac-tic is an effective spot-on treatment for the prevention and control of ticks and fleas in dogs. More information on this product can be found in the leaflet at the bottom of the page. Prac-tic is effective against new flea infestations for at least 4 weeks. Prac-tic has a persistent effect against ticks for 4 weeks. Do not use in dogs younger than 8 weeks, or with a body weight of less than 2 kg. Do not administer to cats, this may lead to overdosing. Do not use in rabbits. The recommended minimum dose is 12.5 mg Pyriprole per kg bodyweight, which is equivalent to 0.1 ml of Prac-tic spot-on solution per kg bodyweight. For each weight class, the total pipette contents should be used. For dogs weighing 2 - 4.5 kg, order Prac-tic XS (56.72 mg Pyriprole spot-on solution for very small dogs). For dogs weighing between 4.5 and 11 kg, order Prac-tic S (137.5 mg Pyriprole spot-on solution for small dogs). For dogs weighing between 11 and 22 kg, order Prac-tic M (275 mg Pyriprole spot-on solution for medium dogs). For dogs weighing between 22 and 50 kg, order Prac-tic L (625 mg Pyriprole spot-on solution for large dogs). For dogs weighing more than 50 kg, you can create a combination of the above variations to arrive at the appropriate dose (i.e. 12.5 mg /kg body weight). In order to reduce the risk of reinfestation, you must treat the environment. A spray such as Indorex Pesticide spray has been specially developed for this purpose. Below are some recent questions we've received regarding Prac-tic Spot On Flea Treatments for Dogs, including answers from our team. Dogs should not be bathed or shampooed from 48 hours before treatment. Immersion of the animal in water or shampooing within 24 hours after treatment may reduce the efficacy of the veterinary medicinal product. However, weekly immersion in water did not affect efficacy against fleas and ticks. How soon after using Frontline (which failed) can I use Prac-Tic? The active ingredients are completely different, so there should be no adverse interaction using these products in quick succession. However it is good general advice to allow 7 days between any types of spot-on medication to reduce the chances of skin irritation, so I would suggest that length of time. On the topic of Frontline not working, I would say that it is not a terribly potent product and I feel it tends to kill off a large percentage of the fleas around, but not every single one. If it is used before fleas are seen as a preventative and applied every month, it is actually extremely effective. No fleas are normally ever seen when it is used like this. However if it is applied after fleas are seen, it often takes a few months to eradicate the problem if no other porduct is used. It will get there in time, but these days there are other options as you are aware. Some other spot-ons do appear to be more effective in this circumstance, but I do not think that this is down to fleas developing "resistance" to Frontline. It has always worked like this, but at one time it was far and away the best product out there. Now there is much more choice.